Oh no, feel better soon. My elder daughter has much the same symptoms so we've been alternating paracetamol and ibuprofen, never a fun combination. Hope the weather doesn't throw too much of a spanner in the works ... For the first time this year I have had to do contingency food shopping to avoid the possibility of fishfingers on Christmas Day if we can't get to where we're meant to be! I hope you feel better soon Diana. Oh do get well soon - hopefully a good rest with Walter will do the trick! Hope you are able to get to where you want to be in time for Christmas. Get well soon! Strange that our little tow of the country seems to be one of very few areas with NO SNOW..but just a short way up the A30 it seems virtually impassable. Raging temperature is a message to the busy person who might otherwise not be listening! Stay put till you feel better - bed, maybe with knitting, might be just what you need. Hope you get well very very soon you poor thing. Is Walter able to mop your fevered brow too? Spoke to my parents this morning who are waiting to see whether they'll be joining us for Christmas this year, somehow I doubt it alas but you never know. I am so sorry - I recognise those symptoms and I have had that flu bug. Go to bed and keep warm and you will be well very soon. Take care. 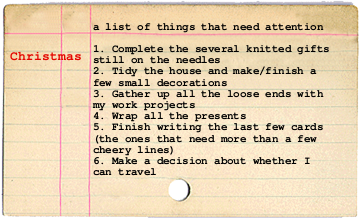 we are snowed in here, so getting through my list. Sorry to hear you are not well - I had that lurgy for most of Novemeber.. it was miserable. Get well soon! Hope you're feeling better by now. Cuddle up to Walter!